Is Coffee Bad For Kids And Teens? When you look at my other posts, you mostly find pro-coffee articles about the best coffee makers for your home. Hidden Caffeine - Can We Blame The Marketing Industry? So you may wonder, why I suddenly write a post about coffee being bad? Not too long ago I stumbled upon an article of the Washington Post about kids and caffeine. A few years back I would probably have not paid too much attention. But now that I have my own children, I started to wonder: Is coffee bad for teens? How can I influence the caffeine intake of my kids? I was able to gather a lot of valuable information with the help of the website caffeineinformer. In short, I was stunned and somewhat shocked what I found! Surely we all know about coffee and caffeine and too much is not good. But did you know, for example, that a large sweet tea of McDonalds has the maximum amount of caffeine recommended for teenagers? Or that a chocolate covered graham cracker has 6 mg of caffeine? Granted, that does not sound too much but who in the world eats only one? For that reason I wrote this post: to share my findings with you and make you aware of all the sources of caffeine! 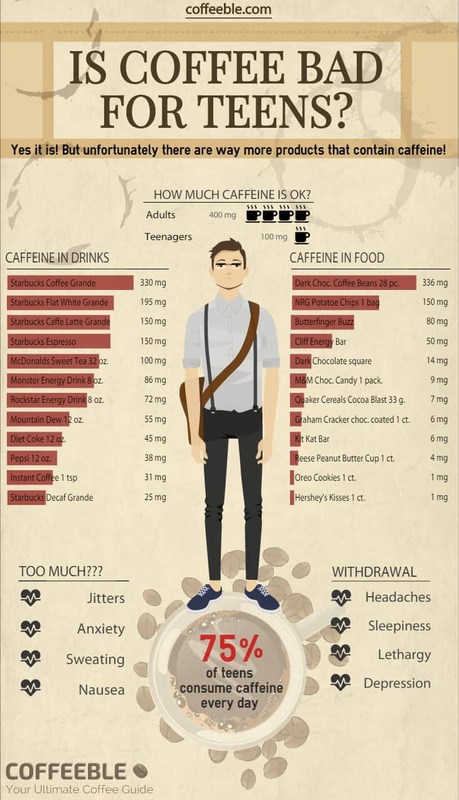 My findings of how easy it is for our kids and teenagers to consume so much caffeine. As a side note, I would like to emphasize that I am not a doctor and the accuracy of the information in this post is not guaranteed. If you think that you or your child suffers from any medical problems related to caffeine, you are advised to seek professional medical assistance! In my opinion, the answer is a big YES! When you look at caffeinated products like chocolate bars or gum, they are without a doubt targeted towards teenagers and kids. Fancy, glittering packaging, cartoon characters or even hardworking, successful people are used to attract our teens. The industry wants them to believe that those products are cool and trendy and help them to cope with stress. Knowing that this age group is more and more under pressure with school and college, it has been an easy target to increase profits. And if you are still not 100% convinced, check the websites of the energy drink companies and see what cool and hip events they sponsor: BMX, Snowboard, Skate, just to mention a few. Have you ever asked yourself: Is coffee bad for teens? The majority of us does not take caffeine seriously enough as a health risk for teenagers and kids. But can we be blamed! I’m not sure! Why? At first, because almost every day you can read a new study online that a few cups of coffee a day are good for you! But: Those results do not count for teenagers! And secondly, would you blame caffeine if your kid is tired all day, depressed or has a lot of headaches? Probably not. 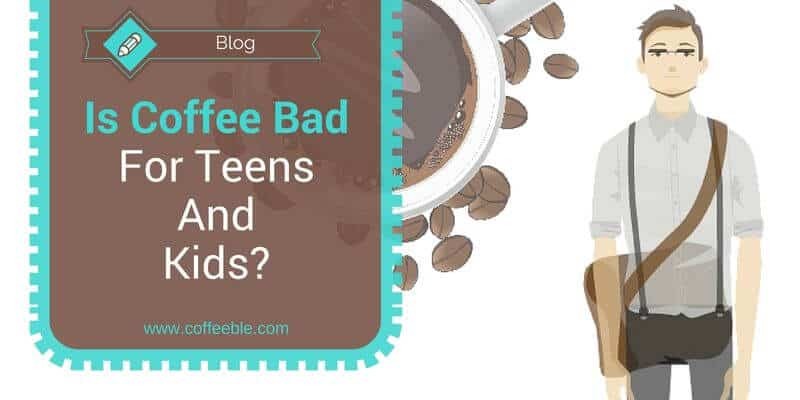 Reading my post was a good start and I hope you could get some useful information about caffeine and teens. I will obtain more information and get familiar with all the companies that try to seduce my kids. Before I can share my concerns with my children I must do my homework! And if you are a teenager and reading this post right now, all I can do is ask you to consume caffeine products wisely! Please share this post with parents, friends or anybody you think has an interest in this topic! Tell me, what is your opinion about coffee, caffeine and kids?